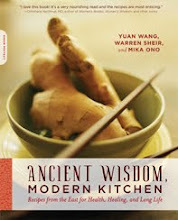 Ancient Wisdom, Modern Kitchen Blog: San Diego Discussion and Potluck "Food is Medicine: Maintaining Our Center"
San Diego Discussion and Potluck "Food is Medicine: Maintaining Our Center"
Warren will step up as one of the featured panelists in "Food is Medicine: Maintaining Our Center" in Pacific College's Integrative Medical Discussion Group in San Diego on Friday, March 12, from 7 to 9 PM. The event is free and open to the public. Gastrointestinal (GI) health and integrity are now understood to lie at the center of most modern diseases, and the role of gut permeability in autoimmune disorders cannot be overemphasized. This concept has long been implicit within Chinese medicine. "From Spleen-Stomach vacuity weakness, the hundreds of diseases arise [like] a swarm of bees." The Nei Jing states, “When one has stomach qi, then one has the mechanics for life. If one no longer has stomach qi one dies.” The Chinese believe that the spleen and stomach constitute the Center of Life, the pivot around which vitality revolves. Preservation of Center Qi and GI health is one of the essential therapeutic precepts of traditional Chinese medicine. Safeguarding the spleen and stomach requires constant vigilance in observing proper eating habits and the consumption of clean, healthy foods. Join our integrated panel as we discuss the roles that diet, digestion, and food will play in the future of Integrative Medicine. From 7 to 7:30 PM, the event will include open networking and potluck—bring a dish to share! From 7:30 to 9 PM, the discussion will highlight panelists John Kasawa, M.D., Heidi Wittmann, N.D., Sarita Vighne, MSTOM., and of course our own Warren Sheir, L.Ac. Finally, from 9 to 9:30 PM, participants who want more can engage in further networking. To RSVP for the event—to be held at Pacific College of Oriental Medicine, 7445 Mission Valley Road, Suite 105, Room 119 San Diego, CA 92108—contact Deb Davies (619) 574-6909 x145 or ddavies@pacificcollege.edu. For more information on the Integrative Medical Discussion Group, which aims to build bridges among all types of health practitioners, look to the group's Facebook and MeetUp pages. This is terrific work in culinary medicine: I'm thrilled to read about it, and wish I could attend. Attendees might also want to access http://chefmd.com for food-as-medicine recipes, and a growing community of like minded eaters!